Kayla Dean, junior feminist and future journalist, is about the break the story of a lifetime. She is auditioning for the Lady Lions dance team to prove they discriminate against the not-so-well endowed. But when she makes the team, her best friend and fellow feminist, Rosalie, is not happy. Now a Lady Lion, Kayla is transformed from bushy-haired fashion victim to glammed-up dance diva. But does looking good and having fun mean turning her back on the cause? Can you be a strong woman and still wear really cute shoes? Soon Kayla is forced to challenge her views, coming to terms with who she is and what girl power really means. Narrated with sharp language and just the right amount of attitude, The Kayla Chronicles is the story of a girl's struggle for self-identity despite pressure from family, friends and her own conscience. Kayla's story is snappy, fun and inspiring, sure to appeal to anyone who's every questioned who they really are. Sherri Winston lives in Ft. Lauderdale, FL, where she is a columnist for the South Florida Sun-Sentinel. 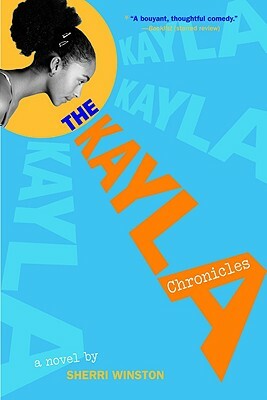 The Kayla Chronicles is her debut novel.